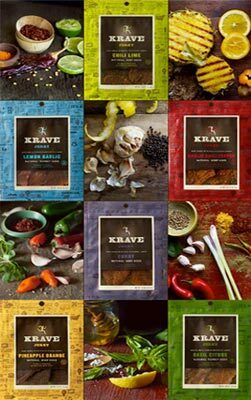 We are huge fans of Jerky so when I found Krave Jerky there was no surprise we had to give it a try! I was pleasantly surprised to find all the different flavors they offered and not only that but the different meats they offered as well! My favorite is the Basil Citrus Natural Turkey Jerky that doesn’t include any artificial ingredients and still offers a sweet natural flavor. The citrus and basil blended really well together and even Aly at two years old could enjoy a few bites of this one. I loved how tender it was and easy to enjoy. The second bag we tried was the Lemon Garlic Turkey, and although I love lemon garlic seasoning, I wasn’t to sure about trying this on Jerky. The blend is almost unheard of until now! The flavor was filling without being overpowering. While we had the opportunity to try several bags, I have to say I am missing the Sweet Chipotle, I do believe the boys have stolen it! I got to enjoy a bite, but now the bag has vanished and I am pretty sure I saw Mr. Maison with it last night. The hunt continues to find the missing bag! I guess that means they like it right? Krave Jerky offers flavors I have never heard of before, and although a little weary about trying them, we were pleasantly surprised at how much we enjoyed every bite! I don't blame the boys! I think I'd want the chipotle as well! Wow, they have a lot of flavors! My Hubby would probably love most of them...especially the Chili Lime and Smoky Teriyaki Pork flavors. I'm more of a plain salt/pepper jerky person myself. Last week we made our own jerky for the first time! Used ground venison...turned out surprising well.